Paul Manafort, advisor to Republican presidential candidate Donald Trump's campaign, checks the teleprompters before Trump's speech at the Mayflower Hotel April 27, 2016 in Washington, DC. The campaign confirmed that Manafort's responsibilities will increase as Trump looks on to the general election. Donald Trump's campaign chairman Paul Manafort resigned on Friday in the wake of campaign shake-up and revelations about his work in Ukraine. In a statement issued as he arrived in Louisiana to tour the flood-ravaged state, Trump said Manafort offered his resignation Friday morning. The billionaire called Manafort "a true professional." "I am very appreciative for his great work in helping to get us where we are today, and in particular his work guiding us through the delegate and convention process," Trump said. 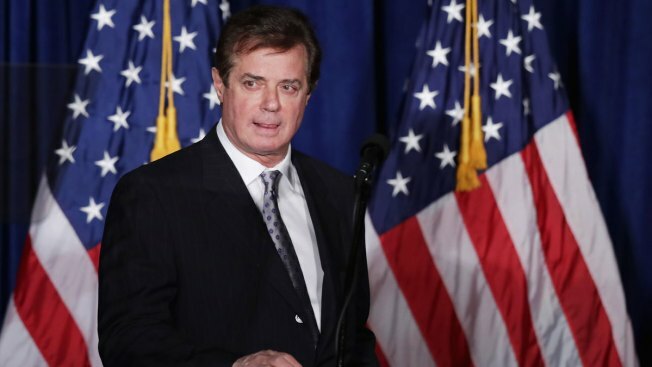 Manafort's resignation comes a day after The Associated Press reported that confidential emails from Manafort's firm contradicted his claims that he had never lobbied on behalf of Ukrainian political figures in the U.S.
Emails between Manafort's deputy, Rick Gates, also a top Trump adviser, and the lobbying firm Mercury LLC showed that Manafort's firm directly orchestrated a covert Washington lobbying operation on behalf of Ukraine's then-ruling political party. The effort included not just legislative outreach but also attempts to sway American public opinion and gather political intelligence on competing lobbying efforts in the U.S.
Manafort and Gates never registered as foreign agents for their work as required under federal law. In a statement Friday, Hillary Clinton's campaign manager, Robby Mook, said Manafort's departure signals a connection between Trump and "pro-Kremlin elements in Russia." "You can get rid of Manafort, but that doesn't end the odd bromance Trump has with Putin," Mook said. "Trump still has to answer serious questions hovering over his campaign given his propensity to parrot Putin’s talking points, the roster of advisers like Carter Page and Mike Flynn with deep ties to Russia, the recent Russian government hacking and disclosure of Democratic Party records, and reports that Breitbart published articles advocating pro-Kremlin positions on Ukraine." Mook also challenged Trump to "come clean on his own business dealings with Russian interests." Also Friday, Ukrainian anti-corruption investigators released copies of handwritten ledgers detailing possible cash payments from Ukrainian political figures to Manafort totaling more than $12 million. Details of the payments described in the ledger were first reported by The New York Times. Manafort denies receiving those payments. Earlier this week, Trump brought in a new campaign chief executive and campaign manager following a disastrous stretch in which the New Yorker committed a series of errors and fell behind Democratic nominee Hillary Clinton in both national and battleground state preference polls. The new campaign manager, Kellyanne Conway, had described Manafort and Gates as part of a new "core four" atop the Trump operation with her and CEO Stephen Bannon.